Gah I kept messing up today with the UVs and ended up going through 3 different versions of this because I didn’t realise how warped the texture got at the seam. Anyway this is what I have after todays work. The textures are set up so that all the colours can be easily changed in Maya if need be. 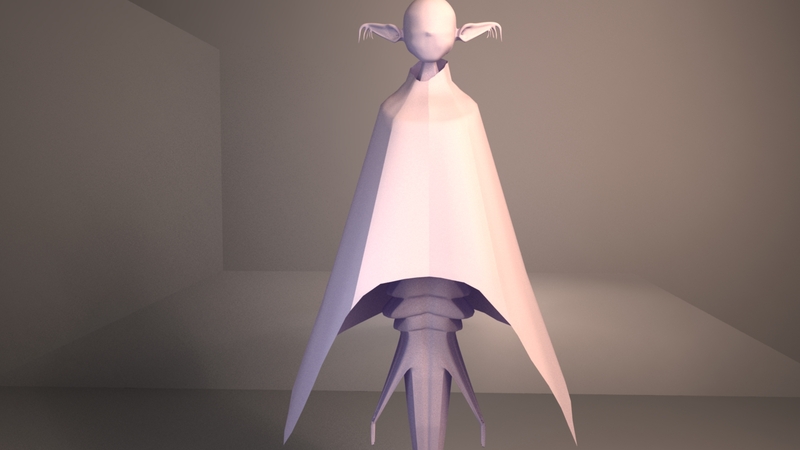 Modeled the cloak and head scales. Textured the model. 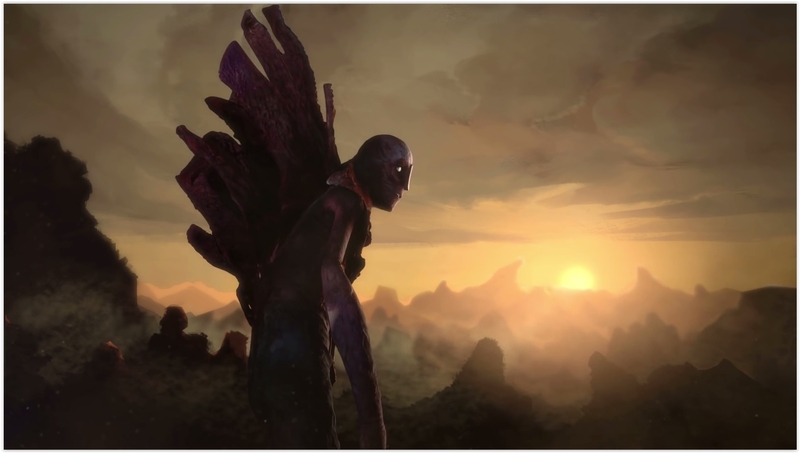 We were watching The Wanderer (2015) with Yuan and she pointed out the use of light and tonality (see screenshots below). She suggested that we should think of our animation in terms of greyscale first as it’s easy to get carried away with colour. I think we could do this by either light intensity, shading darker to lighter with materials or Alec also mentioned how we could render using layers but I’d have to look that up again. 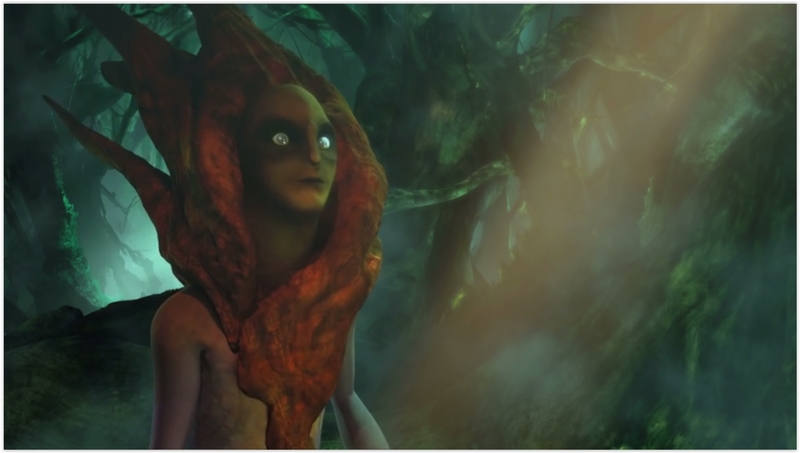 Once we have our lights and darks sorted out it might be good to consider how we can make depth with a range of warm to cold colours leading into our scene. Abigail and I were discussing having warm colours on the character and colder on background maybe? 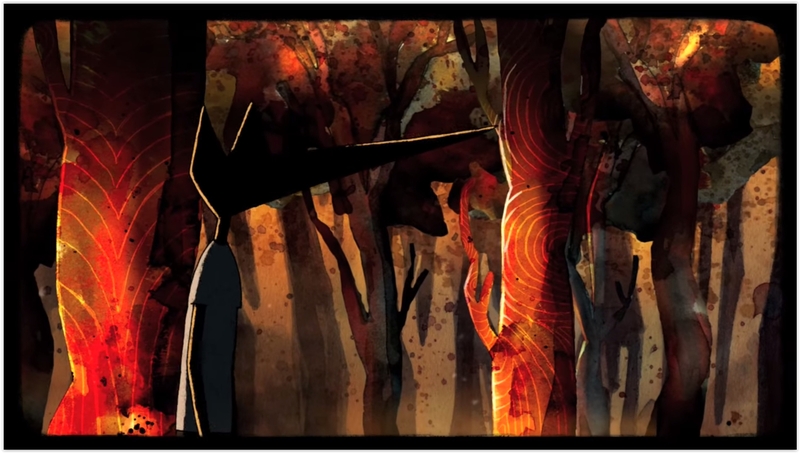 I also think because our animation is happening around sunset and dusk that the light and shadow contrast would be quite soft. Yuan pointed out that the use of very soft filtered light might add to the romantic mood that’s happening in our scene. 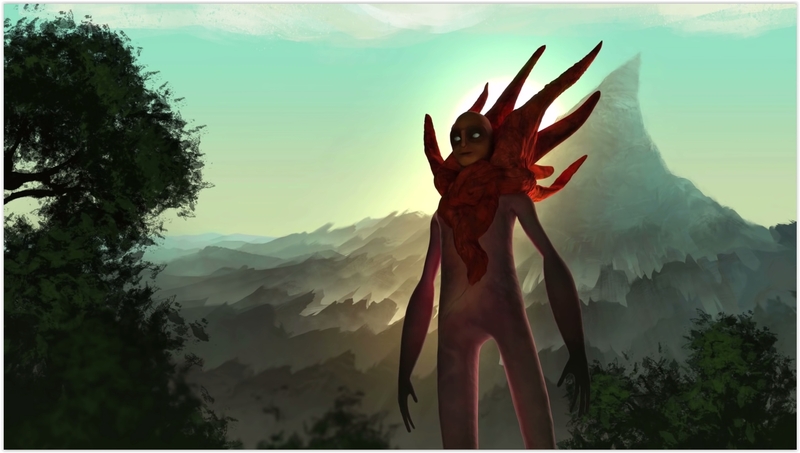 Something similar to this back lighting might happen in ours at some point as Anam is travelling towards the sunset. Yuan also mentioned today that we need to focus more on our cause and effect in the story so that it just doesn’t look like a character moving around from a to b without purpose. She suggested that we give more time for our first and last shot (and less time to middle) so as to give time to establish the setting and then show the effect. As we discussed before, getting the setting across and giving the story context will be very important for our story to work. Yuan agreed that the textures and detail will be very important for this but we need to make sure that the background never overpowers our main focus which is the character. 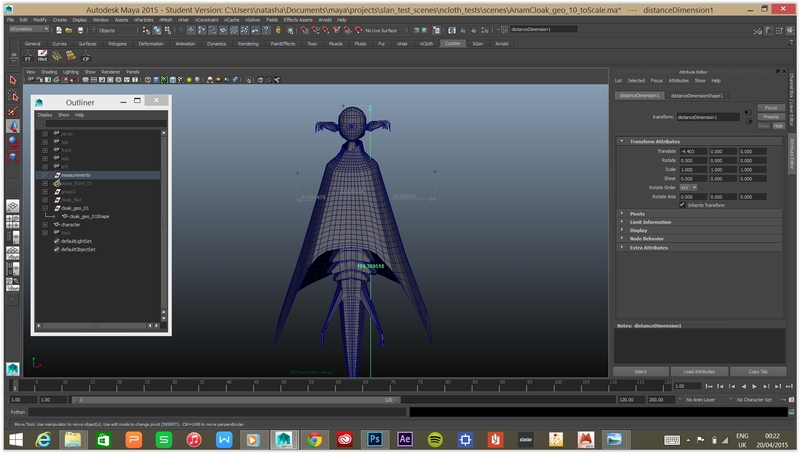 This is the cloak that I modeled to go over Abigail’s model of Anam and then converted to nCloth. I had started this by cutting a plane into the shape of the cloak out flat thinking that it would be easy to fold loosely in place for falling over the character. Duplicating the faces of the torso and extending the geometry down turned out to be a much easier solution and I then tried to reroute the mesh so that hopefully it deforms more cloth-like. Ambient occlusion<3 It looks like I might have to apply it to the output mesh separately to the input mesh. These are tests with Anam. We might get a better result if we apply one of the cloth presets or I can play with the cloth thickness or other attributes. 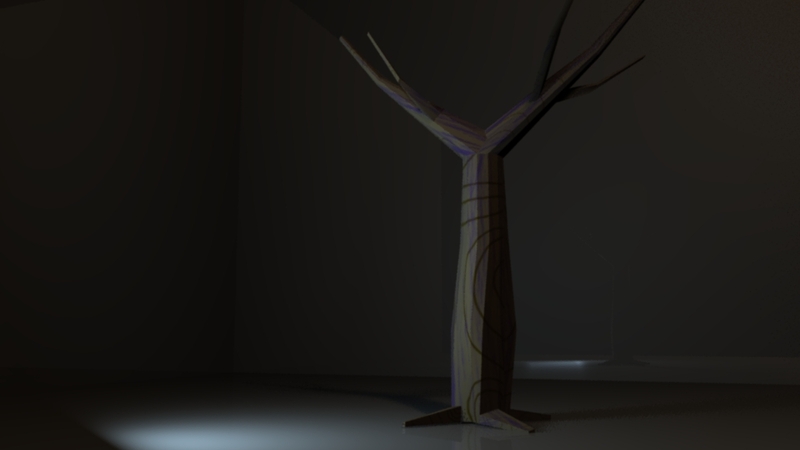 This is one of the 2D trees that I didn’t upload last time. I liked the red outline that happened from having an incandescent red material underneath the other colours. I was trying to shape it more so that it would point towards the character in the scene also. 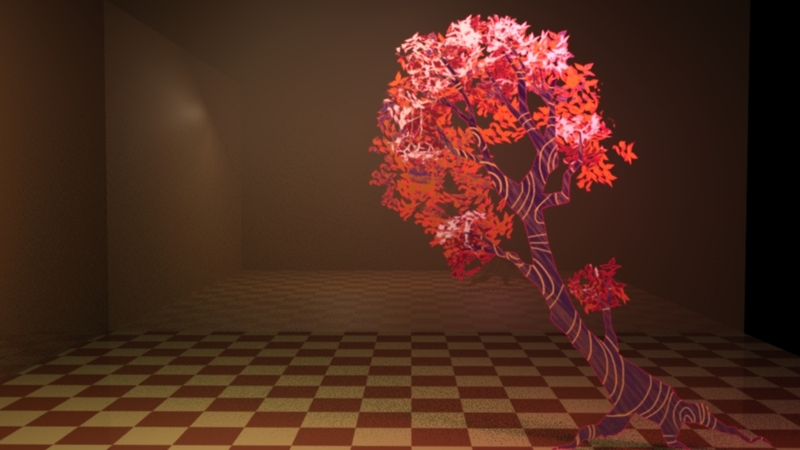 Today I UV unwrapped Clare’s 3D tree and tried to apply similar textures to those on my 2D trees. I think next time I’ll have to plan ahead a little more and place the seams in a place that the camera won’t see. Look at the difference between 540 and 1080 quality in these two renders. The 1080 one took about 10 times longer at 26mins 5secs. I’ll have to figure out what Alec was telling me about baking textures if we want to render at this quality but quicker. 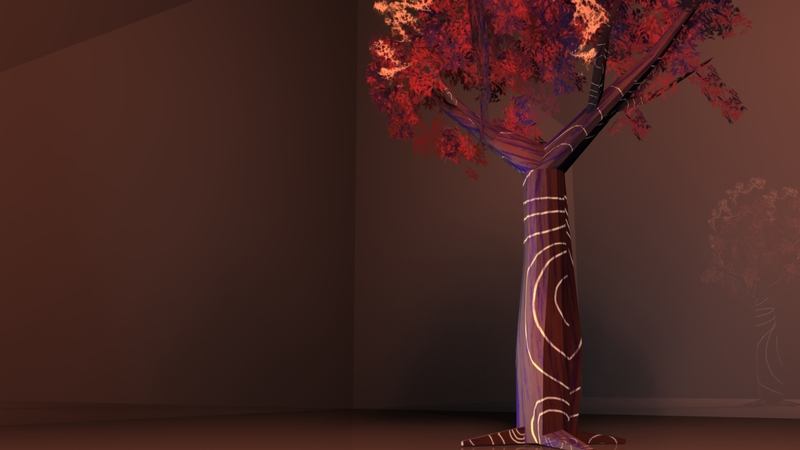 These are good videos to recap UV mapping. I didn’t know for a while why my alpha channel textures weren’t showing in the viewport and it was because Clare had the legacy default viewport turned on instead of viewport 2. 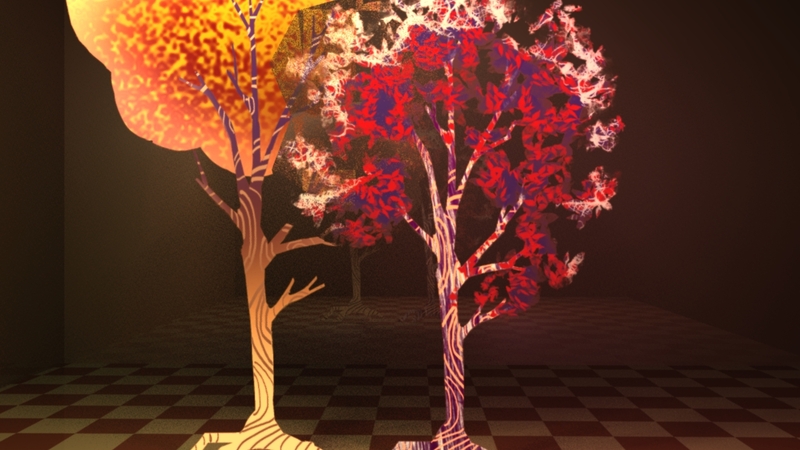 These are some trees that I’ve been experimenting with over the past few days by making alpha channel shapes in photoshop, plugging them into materials and layering the materials in layered shaders. It’s interesting to see how different coloured lighting and camera angles can affect the scene also. 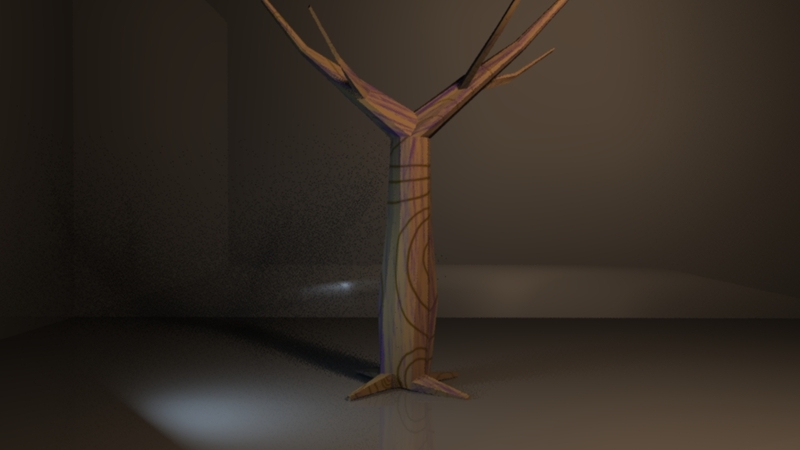 I tried going through the different options in the material attributes, the group shader node, the lights and the global render settings but no luck. I posted about it on CGSociety and someone suggested that I use mia_material_x and use the cut out opacity attribute instead. It doesn’t seem to work with the .tga files that I’ve created but I’ll try again. My imported textures from Photoshop weren’t behaving as I expected them to do. I thought that I could control a material’s transparency by plugging in a black and white image into it’s transparency node (with black making areas transparent). It took me a long time to realize that this only works for some attributes, like specularity, and that I needed to make an image with an alpha channel in order to control colour. I use masks all the time in Photoshop but somehow making an alpha channel has always flown over my head, even though it’s really easy! You literally make a selection (or select a mask), go into the channels tab and then press the ‘save selection as a channel’ button beside the ‘new layer’ button. These were some tests I did to see how painting on UV snapshots in Photoshop and importing to Maya works. I was also trying to see if I could make a traditional media look work in Maya and had some fun layering my texture with different textured materials. This is really great being able to hear the raw sound effects side by side with their application in the movie! The sounds of Star Wars are beauuuutiful. The whole process is like sculpting with sound.